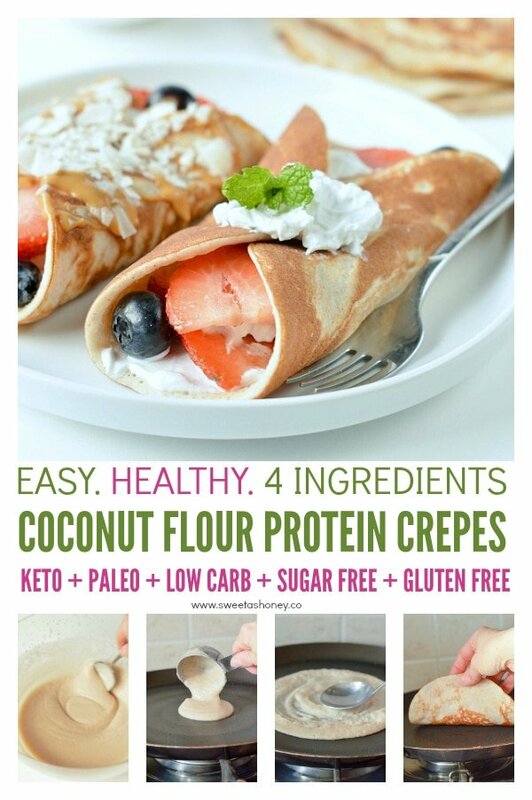 Protein crepes are healthy low carb high protein gluten free breakfast crepes made of 3 simple ingredients. 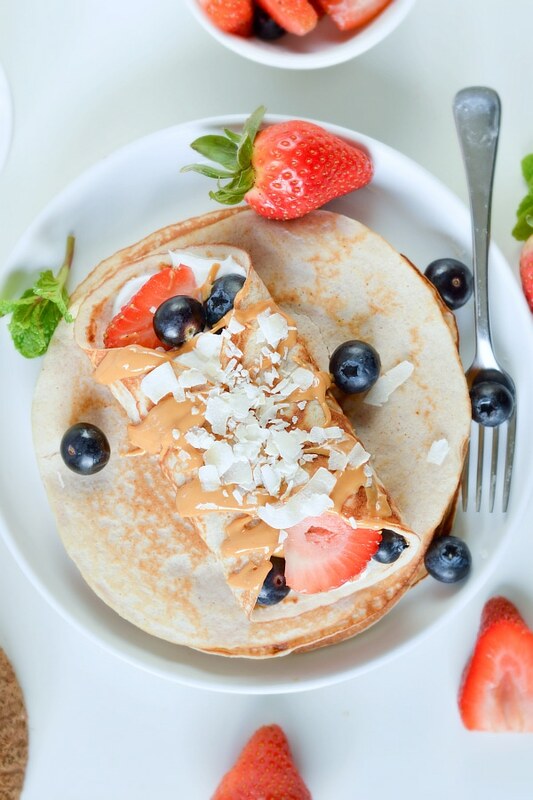 A sweet clean eating recipe perfect for breakfast or post work out. You know my obsession for crepes right? 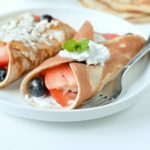 There is probably more than 10 crepes recipes on this blog – including the best low carb crepes ever : coconut flour crepes and almond flour crepes. Well, I am French so eating crepes at least one time a week is in my blood. But recently, I really wanted to create a new crepe recipe for my post work out breakfast. I usually work out on empty stomach, come back at around 10.00 am super hungry. Egg white – I am using regular size eggs -size 6 in New Zealand. I keep the egg yolk to make custard. You can also buy organic egg white diectly from the store, it makes the recipe faster. 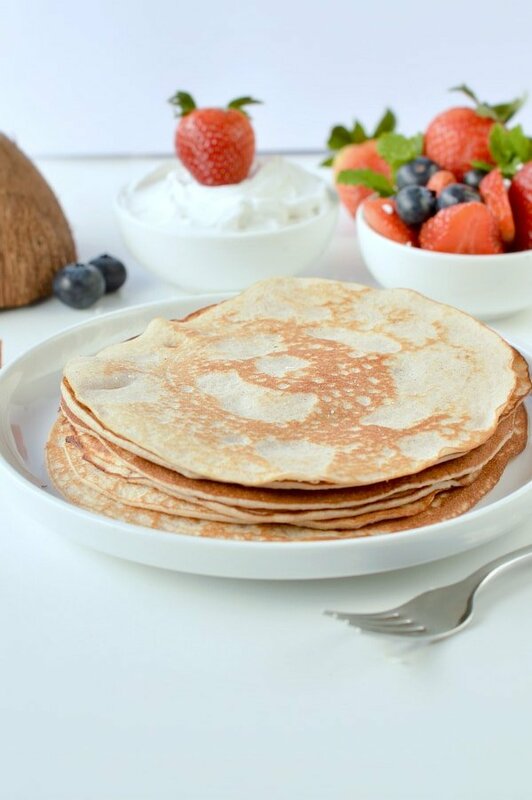 Unsweetened almond milk – feel free to use unsweetened almond milk or the vanilla unsweetened almond milk if you want to add a hint of vanilla to your crepes. I love both, used Almond Breeze unsweetened Almond Milk range as always. It is light in flavor and perfect in baking – specially the vanilla one, you don’t have to add extra vanilla extract in the recipe with the vanilla one. 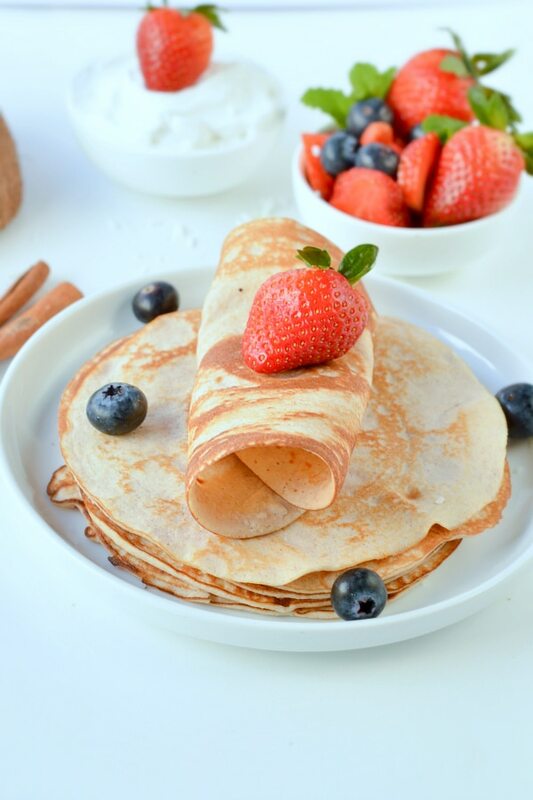 Sugar free crystal sweetener – optional, I like my protein crepes sweet so I am adding Monk fruit crystal sweetener in this recipe. If you want to eat those savory replace by 1/4 teaspoon of sea salt. 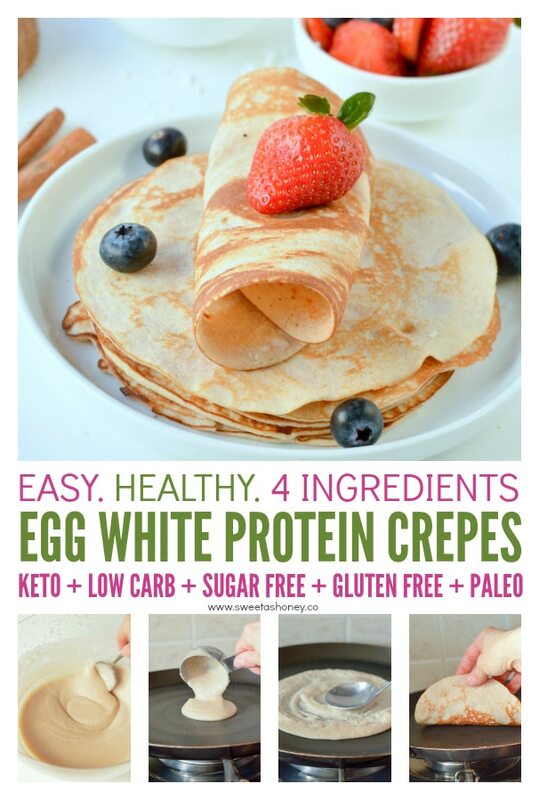 Those protein crepes are very easy to make. Measure your egg white in cups or grams ! I am using regular size eggs but it is more precise if you measure the egg white in volume or weight. Same for the coconut flour, weight it if unsure of your tablespoon measurement. 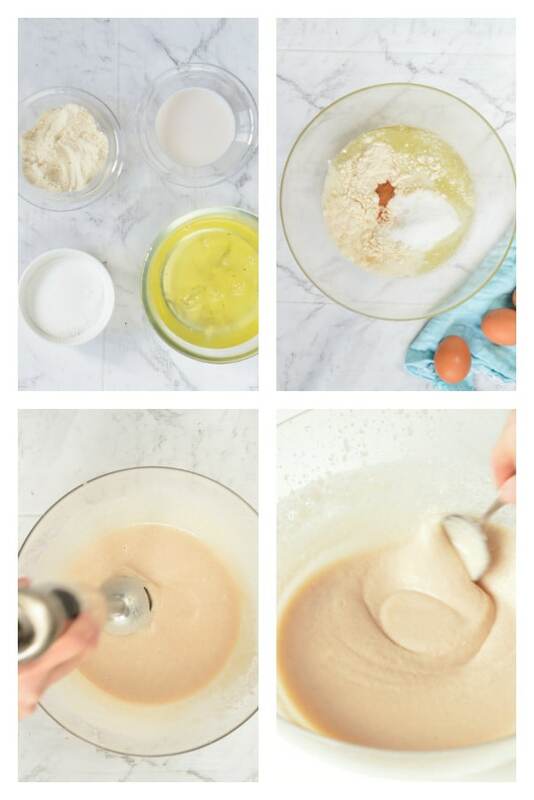 Use a stand mixer to gently mix the batter. This ensure there is no coconut flour lump in your batter. Don’t use a manual whisk or it will result with lots of lumps. You can also use a blender on low speed, the one for soup not for smoothie, don’t over blend it, 30 seconds max. Also, if you use the immersion blender method, use a bowl with high border to avoid the mess! Your batter must be slightly thicker than a regular crepe recipe, closer to a pancake batter, slightly thick and grainy. Don’t swirl the pan to spread the crepes ! This is NOT a regular french crepe recipe. I found it easier to scoop 1/4 cup batter in the center of my hot greased non stick tefal pan. Then use the back of a tablespoon and starting from the center of your batter, make motion circles to spread the batter from the center to the side and form a round crepe. It takes time and practice to have the perfect motion circle move – see my recipe video – but as soon as you get it, your protein crepes will be beautiful. 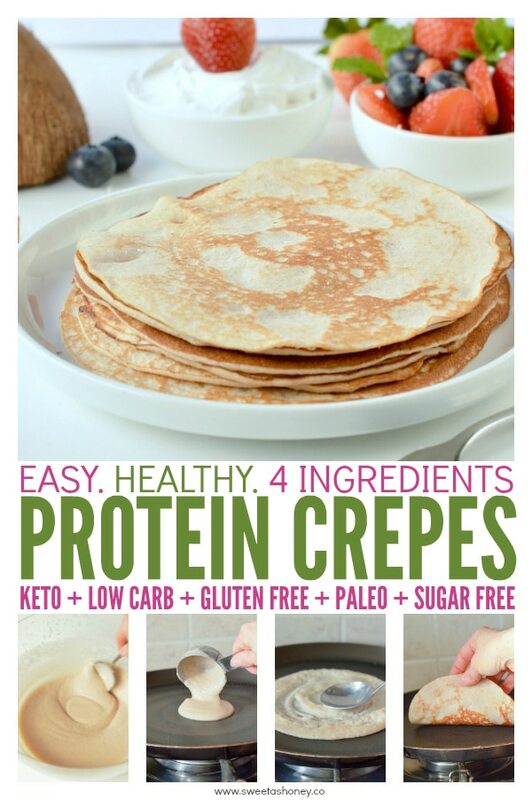 One of those little protein crepes contains 9.7 f of protein for only 2.2 g of net carbs. I love to eat 20 g of protein for breakfast. To reach my target, I fill my crepe with 1/4 cup of protein yogurt, some fresh berries and extra tablespoon of almond butter. All together I reach 20g of protein for only 1 crepe! 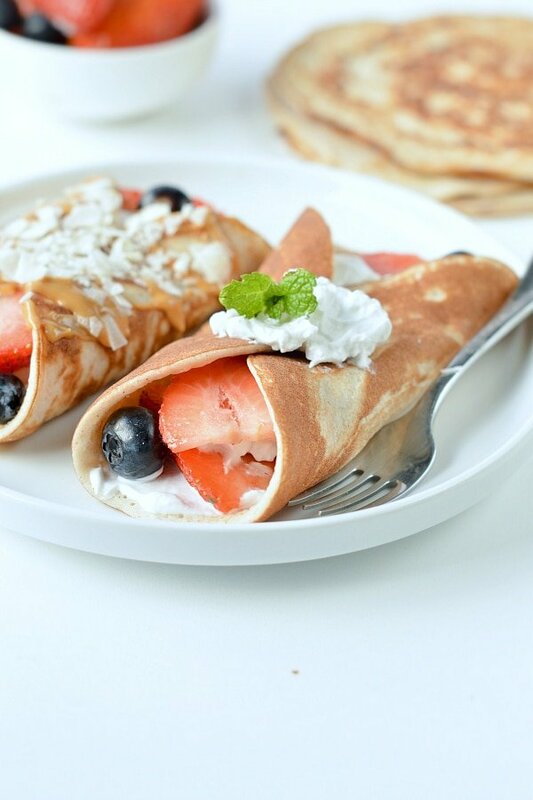 Watch the protein crepes recipe video and make them now ! In a large mixing bowl, add all the ingredients. Use an immersion blender to combine all the ingredients together. You can also use a blender on low speed. Blend for less than 30 seconds to avoid to add too much air in the batter. Using one of those methods avoid coconut flour lumps in the batter, a manual whisk is not recommended! Set aside 5-10 minutes to let the fiber absorb the moisture. You should obtain a slightly thick batter, not as thick as pancake batter but thicker than a regular french crepe batter. It is a bit 'grainy' too, that is normal. If too liquid - could happens if you didn't measure the egg white in cups or grams - adjust adding 1 teaspoon coconut flour at a time until the batter is slightly thick as on my video. Place a 8-inch crepe pan over medium heat. It is very important to use a non stick pan like mine here or crepes may stick to your pan! Add 1/2 teaspoon of coconut oil to coat the bottom of the pan. I like to rub the oil with a piece of absorbent paper. Let the pan 1 minute under medium, until it gets hot. Pour 1/4 cup of crepe batter, in the center of the pan. Immediately use the back of a tablespoon to spread the batter into a round circle shape crepe. To do so, place the back of the spoon in the center of the scooped batter, by circular motion spread the batter from the center to the outside until it forms a nice, thin, round circle crepe. Don't tilt the pan to spread this batter or it will bread and won't work as for regular french crepes. See recipe video for more details on spreading. Cook for 2-3 minutes or until the bottom of the crepe slightly browned, the border get darker and the top is drying out. Carefully work a spatula underneath it and flip the crepe. Cook on the other side for barely 30 seconds or just to set the batter. Cool down on a plate for few minutes then spread your favorite toppings. 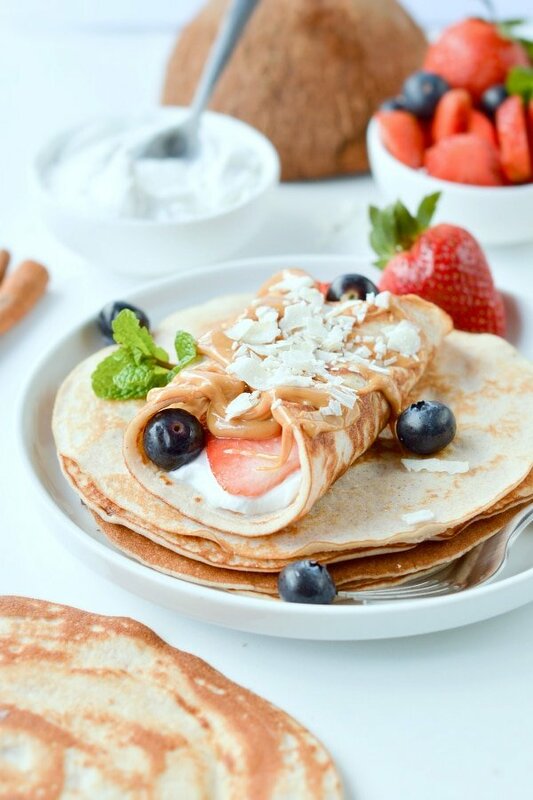 Fill your crepe with 1/4 cup of protein yogurt, fresh berries, and a tablespoon of almond butter. Feel free to sprinkle extra sugar free icing powder on top or sliced almonds! Store your crepes in the fridge, on a plate, covered with plastic wrap to avoid them to dry out. You can store them up to 4 days in the fridge. Rewarm slightly on a hot pan for 1 minute or microwave 30-45 seconds. Crepes size: I made 6 crepes of 20 cm with this recipe. 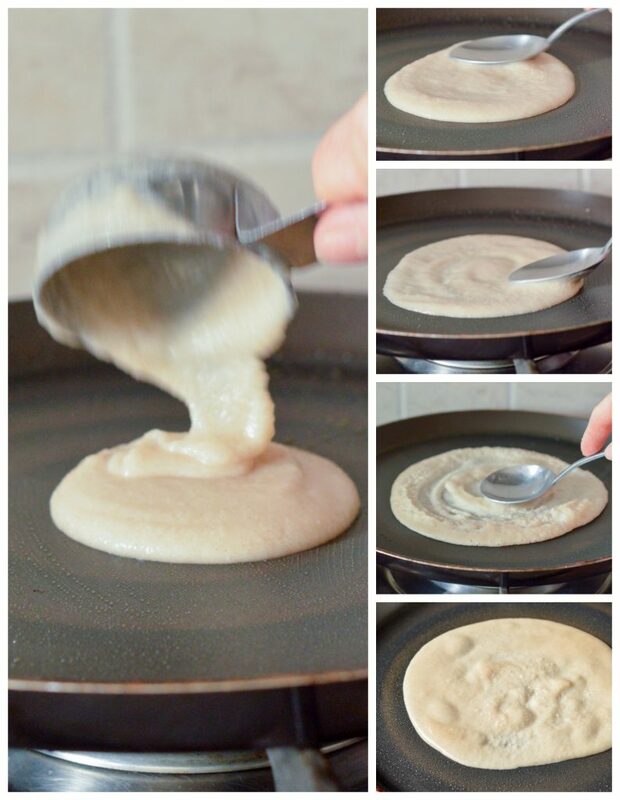 Crepe pan: use a non stick pan or a crepe pan like this one. Nutrition panel is for one crepe without filling. 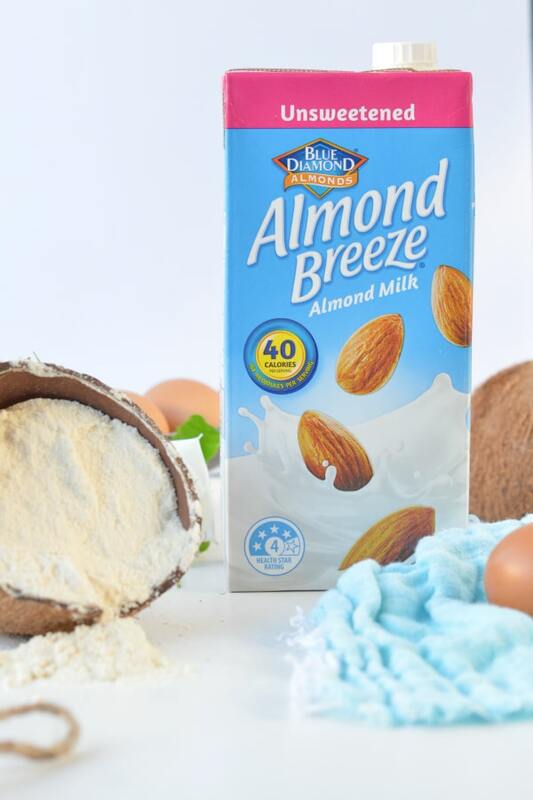 This recipe is sponsored by Almond Breeze Made from the best California Almonds and I received a compensation to develop this recipe but note that I only recommend product I love and trust on this blog. Thank you. YEAH! I am trying to convert my new recipe in grams as I received lots of request about this ! I am happy you like it! Enjoy the crepes. XOXO Carine. Vive la difference! 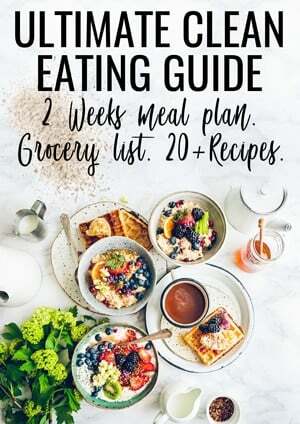 I am a French trained cook who recently adopted a keto lifestyle to combat my weight and diabetes. I have been looking near and far to identify ingredients and techniques to replace my carbs. Then I found Carine. The most creative time in my cooking life was when my wife had a a restrictive non-dairy diet while nursing our first born. To this day we enjoy the lighter than air rice milk waffles and non-dairy hollaindaise recipes that came from that period. Restrictions and limitations embolden our creativity and imaginations as we challenge what we know for what we want. Keto is bringing that experience back to me as a cook. Carine’s generous blog is shining a light on the many opportunities to eat well while eating healthy. Merci beaucoup! That is such a lovely comment and I am so happy to have more French followers on this little blog. Thanks for trying my recipes. XOXO Carine.